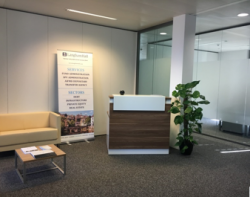 Langham Hall Luxembourg has recently moved to new larger premises on Avenue de la Gare, in Luxembourg city centre, close to the main railway station, with double the floor area of its former office. The Luxembourg Fund Administration and Depositary business has significantly expanded over the past 2 years, both in terms of headcount and client base and expects to follow the same path in 2018, with a continued focus on providing a commercial and responsive client service. Please let us know if you are passing, we would be delighted to show you around. In addition to Luxembourg, Langham Hall operates in London, Jersey, Guernsey, the Netherlands, Hong Kong, Singapore and New York. If you are interested in learning more about the range of services that Langham Hall can provide in Luxembourg then please contact Keith McShea in the first instance using the details below.